Below freezing temperatures. Snow and sleet. Sound familiar? It’s winter in New Jersey. And while winter weather often delivers picturesque scenes of glistening snow-covered trees, it also brings hazardous conditions that result in a higher rate of accidents. Be prepared for the Northeast winter weather and follow these easy tips to stay safe until spring arrives. On freezing mornings, take extra time to warm up and de-ice your car. Clear all snow from the windshield, back and side windows, and mirrors — driving while the windshield is only partially clear significantly diminishes your visibility and puts everyone at risk. Be sure to clear the snow from the roof as well; snow often slides down to the front of the car while driving, blocking the view from the windshield. Black ice is treacherous. This thin layer of invisible ice blends into the black pavement, and is particularly dangerous because it gives the false impression that roadways and sidewalks are clear and safe. The loss of traction when motor vehicles and pedestrians come into contact with black ice results in a significant number of car accidents and slip and fall accidents. Check the outside temperature and when it drops towards the freezing mark, be extra careful, particularly near any puddles or wet areas that may freeze. Many drivers think of sunglasses as a necessity in warmer weather. But the glare of the sun reflecting off of bright white snow or icy waters can be almost blinding. Wear sunglasses to diminish the harsh glare while driving and use your car visor when necessary. When sleet or snow is whipping across the roadway, it is difficult to see what’s in front of you. Help other motorists to see you by turning your headlights on, even in daytime. Allow extra time to reach your destination when traveling in winter weather. Reduce your speed and don’t tailgate. When driving in the snow, it takes four to 10 times longer to stop your car compared to driving in dry conditions. So, stay back, don’t hit the brakes unless necessary, and be cautious when accelerating. Accidents happen. 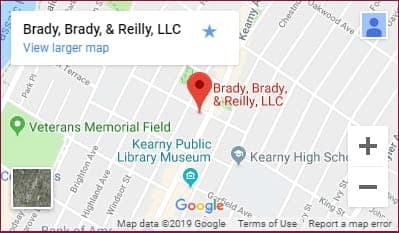 And when they do, the experienced Kearny injury lawyers at Brady, Brady & Reilly, LLC are here to help. Our dedicated personal injury attorneys have been serving New Jersey families for more than 50 years. We are with you every step of the way, advocating on your behalf for maximum compensation for your injuries. Contact a member of our team today at 201-997-0030 or contact us online to schedule a confidential consultation.